Ways we Travel thru my Lens! I clicked the first shot on my way from Chennai to Mumbai and the 2nd shot on my way from Chennai to Madurai, both by train. I generally prefer sleeper class in trains for a few reasons - one is that I can enjoy the nature a lot; the changing scenery and climate from place to place in the long distance journey instead of temperature controlled AC Compartments. The first one was from my train window at the sunset and the 2nd is through the train's door at the greenery and lone house!!! Check out more on my train musings here and here. The next depicts Road. I clicked this during my trip to Agasthiar Paarai. This lady had just crossed the river cauvery by walking across it and takes the grassy dirt road to reach her workplace - a farm. Atop her head is most probably her lunch in a basket. It was a regular way of life for her through dirt roads and farms!!!! One more for road is from my bike ride to Perungudi Lake. Behind me is the lake filled with Pelicans!!! This was a trip very much cherished by me coz that was one of my earliest trip with my bike!!! Over to Water... This was clicked on my trip to Unjalur, near Karur. 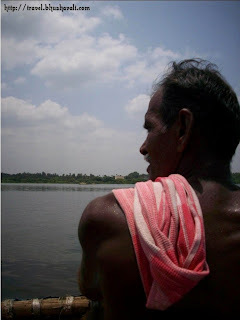 He was the person who rode our coracle (a circular boat made of bamboo and cane).This was our mode of transport from one side of the river Cauvery to the other! His dark skin and red towel against the blue sky was what I totally loved on this composition! One more on water. This was clicked on my trip to Pulicat. This man was on his raft for his everyday work of fishing in the ocean Bay of Bengal! That's not only his regular mode of transport but also his work place!!!! And the final 2 depict Sky! Both were clicked on my trip from Germany to India by Emirates Flight. Both were clicked without using flash, after all the lights were switched off. The top pic is of myself, lit only with the reading light!!! The bottom pic shows almost all the seatback screens on and the star-lit night sky effect on the roof!!! Finally here's my list of nominees to take part in the contest. All the best!!! Wonderful pictures. Last one stands out. Wonderful choices. All the best. Nice shots Bhusha. Thanks for the nomination. simply beautifully captured shots....lovely place to be! Great post and pictures about your transportation modes! Hopefully you weren't to bored on your flight to Germany. I hope my entry (Travel by…) has a chance compared to yours.